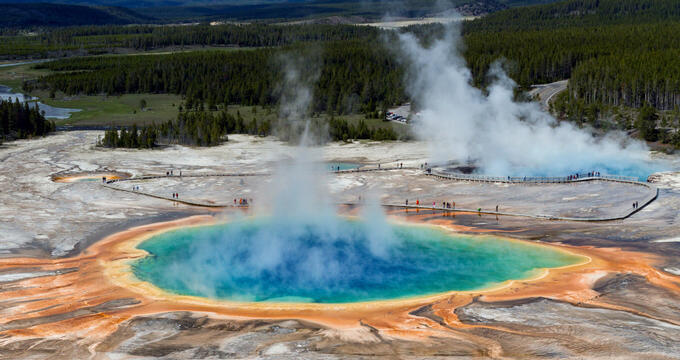 One of the most famous national parks of them all, Yellowstone was also the very first national park to be established in the United States and is generally regarded as the first national park anywhere in the world. It was established back in 1872 and stretches out across the three states of Montana, Wyoming, and Idaho, with over 95% of it being in Wyoming. The park is well known for its immense natural beauty and various landmarks like the Old Faithful geyser and Yellowstone River. Yellowstone National Park covers an area of 3,468.4 square miles and is filled with waterways, lakes, canyons, mountains, forests, and more. It holds one of the highest-elevation lakes and also the biggest supervolcano in all of North America, as well as playing home to all sorts of wildlife from bears and wolves to bison, elk, and many kinds of birds and fish. The history of the park goes back many years, with the area being inhabited by Native Americans for thousands of years. In the late 18th century, French trappers in the area named the Yellowstone River the 'Roche Jaune', which directly translates to 'Yellow Stone' or 'Yellow Rock'. Many hunters and trappers prospered in the area, which began to be explored more thoroughly in the late 19th century. Due to the beauty and diverse ecology of the area, it was given special protection and therefore became a National Park, becoming a key area for all kinds of recreational activity. The elevation of a place tells us how high or low it is in relation to sea level. Gauging the elevation of a huge area like Yellowstone National Park is difficult as the park covers an area of more than 3,400 square miles and features many different landscapes and styles of terrain, including mountains, plateaus, bodies of water, and more. The general elevation of Yellowstone National Park is 8,000 feet (2,400 m) above sea level, which is the average elevation of the Yellowstone Plateau. The Middle Rocky Mountains that surround Yellowstone National Park have elevations ranging from around 9,000 feet (2,700 m) to 11,000 feet (3,400 m). The highest point in the entire park is Eagle Peak, a mountain in the Absaroka Range in Wyoming. Eagle Peak has an elevation of 11,372 feet (3,466 m) and a prominence of just 1,847 feet (563 m). The mountain is a popular spot with climbers in Yellowstone but is quite difficult to access, involving long hikes through the wilderness to reach the top. The lowest point of elevation in Yellowstone National Park is Reese Creek, which is situated at a height of 5,282 feet (1,610 m) above sea level. Other key locations around the park include Mount Washburn, which is the most prominent mountain in Yellowstone and has an elevation of 10,243 feet (3,122 m), and Yellowstone Lake, which is both the biggest body of water in the park and one of the most highly elevated, situated 7,732 feet (2,357 m) above sea level. The elevation of Yellowstone affects its weather conditions quite strongly. The areas with low elevations tend to have warmer average temperatures in general, while the highest areas like the mountains can have below-freezing conditions with a lot of snowfall. This means that the weather in one part of Yellowstone can be very different to another part and the temperature can vary enormously all around the park. The vast majority of Yellowstone National Park is located in the state of Wyoming, which is statistically the second highest state in all of America. The mean elevation of Wyoming is 6,700 feet (2,040 m), second only to Colorado, which has an average elevation just 100 feet (30 m) higher. The average elevation of Yellowstone is therefore over 1,000 feet (305 m) higher than the state average. The highest point in all of Wyoming is Gannett Peak, a mountain located in the Wind River Range, which has an elevation of 13,809 feet. The lowest point of the state is part of the Belle Fourche River on the border between Wyoming and South Dakota, which has an elevation of 3,101 feet (945 m) above sea level. Some of the state’s biggest cities include Cheyenne, which is also the state capital and has an elevation of 6,062 feet (1,848 m), Casper, which has an elevation of 5,150 feet (1,560 m), Laramie, which has a population of 7,165 feet (2,184 m), and Gillette, which has an elevation of 4,554 feet (1,388 m).